G o t o L a n d s c a p e O n l i n e . c o m a n d s e a r c h G r o u n d R e c o n s i d e r e d t o v i e w m o r e f i r m p h o t o s 124 Landscape Architect and Specifier News Ground Reconsidered Philadelphia, Pennsylvania Hawthorne Park Philadelphia, Pa. Hawthorne Park represents a commitment to its community. The park, which occupies a portion of a former public housing site, is now a public amenity providing a much-needed recreational space. The park design embraces the vision and ideals of the constituent community as well as best practices in green stormwater infrastructure. The sustainable and visually dynamic design features topographic changes to create distinct use areas, a raised plaza/performance space and a multi-purpose open lawn punctuated by monolithic granite slab benches. 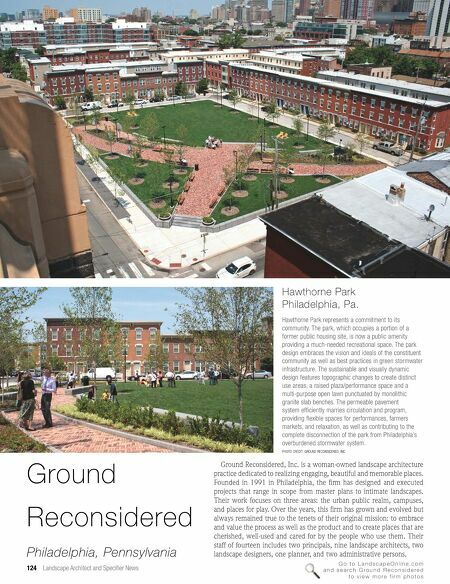 The permeable pavement system efficiently marries circulation and program, providing flexible spaces for performances, farmers markets, and relaxation, as well as contributing to the complete disconnection of the park from Philadelphia's overburdened stormwater system. PHOTO CREDIT: GROUND RECONSIDERED, INC. Ground Reconsidered, Inc. is a woman-owned landscape architecture practice dedicated to realizing engaging, beautiful and memorable places. 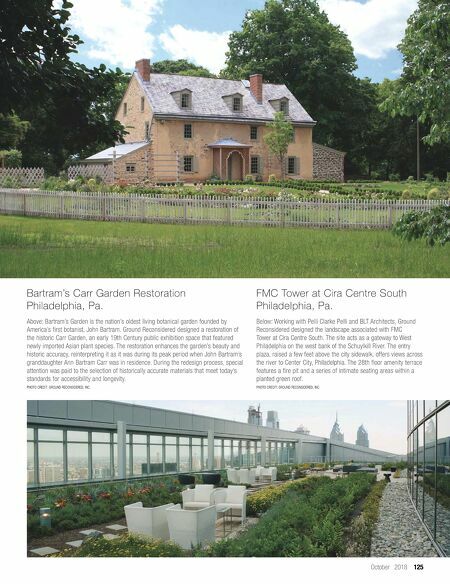 Founded in 1991 in Philadelphia, the firm has designed and executed projects that range in scope from master plans to intimate landscapes. Their work focuses on three areas: the urban public realm, campuses, and places for play. Over the years, this firm has grown and evolved but always remained true to the tenets of their original mission: to embrace and value the process as well as the product and to create places that are cherished, well-used and cared for by the people who use them. Their staff of fourteen includes two principals, nine landscape architects, two landscape designers, one planner, and two administrative persons.